What is Remote Access? | How to Setup Remote Desktop? Similar to computer networking, remote access allows a user to log into a system without being physically present. 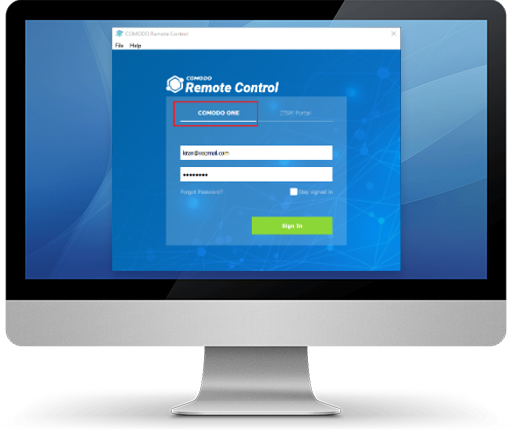 Remote access is effective and convenient for users on the corporate network who can remotely connect to actual system interfaces to trouble shoot issues, install and configure software, uninstall software, and more. Remote Access is mostly used in corporate networks, however it can also be used to access home networks. Comodo introduces RMM (Remote Monitoring and Management), which permits MSPs or IT admins to remotely access endpoints to solve issues. The end-user can view the actions you take while you troubleshoot the issues. Comodo RMM has sophisticated capabilities organized and managed from a unified console. Remote Monitoring and Management solutions operate on Virtual Network Computing Technology, which is flexible enough to work across multiple operating systems. Enable the RMM Extension of Endpoint Manager. Install the RMM Admin Console. The console efficiently helps to monitor endpoints, organize policies, and configure requests from the service desktop. The console has to be installed on a local system or a server. Choose the required endpoint from the list and click to choose the 'Take over' option. This permits you to download the console setup to the target system. Install Client RMM software on target endpoints. This acts as an agent to facilitate communication between the admin console and endpoints. The agent is instantly installed on the endpoints when the RMM extension is enabled in the ITSM. Comodo ONE Remote Access and Control enables administrators to take remote control of the workstations, servers, applications and mobile devices to troubleshoot problems more efficiently. It also provides provision to review and validate performance data and introduce security patches, application updates and configurations to remotely address issues. Remote Access permits remote users to access files and folders on any devices or servers that are connected to the network. Helps to monitor and control the machines that are connected to the network. Quick and instant response to troubleshoot the issues.